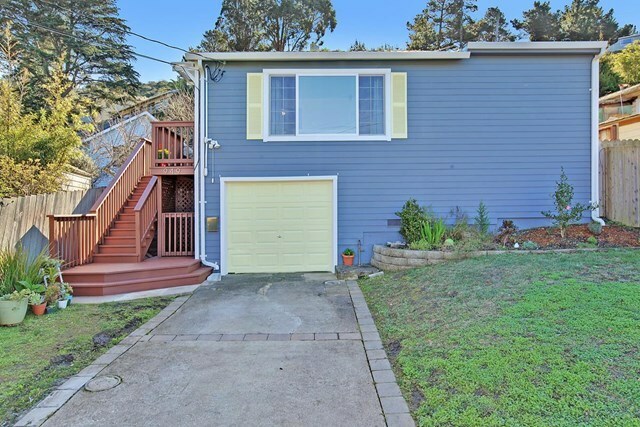 Desirable East Sharp Park location is where you will find this 1940's cottage/bungalow that's nestled in the trees and hills, but close to the beach too. Whether you are a first time buyer or looking to downsize this could be the home for you. Freshly painted inside, beautiful crown molding, newer windows, well maintained, ready for you to move-in. Hardwood floors through-out with tile floors in the kitchen and bath. Lots of natural light in this two bedrooms and one remodeled bath home. Open floor plan and with a great kitchen that opens to a large wrap around deck great for entertaining or relaxing. This home was completely remodeled in mid 2012 & French drain system installed in 2016. Easy HWY 1 access for commuting to S.F. or Peninsula.